It was a bold move to leave accepted conventions behind in our pursuit to produce the finest of juices from the fruit of our vines. ‘Esprit Libre’ came to be in the very heart of our Entre-Deux-Mers region, pure products of this terroir of which limestone is such an integral part. That limestone, used to build the developing city of Bordeaux in the 18th century, gives it its distinctive color, and is responsible for the distinctive flavor of our wines today. Taking great care of the vines, harvesting at exactly the right time, blending the different varieties of grape, the vinification process is an exact science, and sets the tone for a line of products with a character that is a reflection of our own: generous, rigorous and curious. *Classified “Vin de France” at time of bottling. Our ancestors sought shelter in naturally formed limestone cavities found throughout the Entre-Deux-Mers appellation. This limestone is also the reason our wine has such a special character. A carved stone, which was the indispensable tool of its time, the biface is the sign of man’s attachment to the terroir of our region: from its protective limestone recesses to the beneficial grapevines that grow there today. 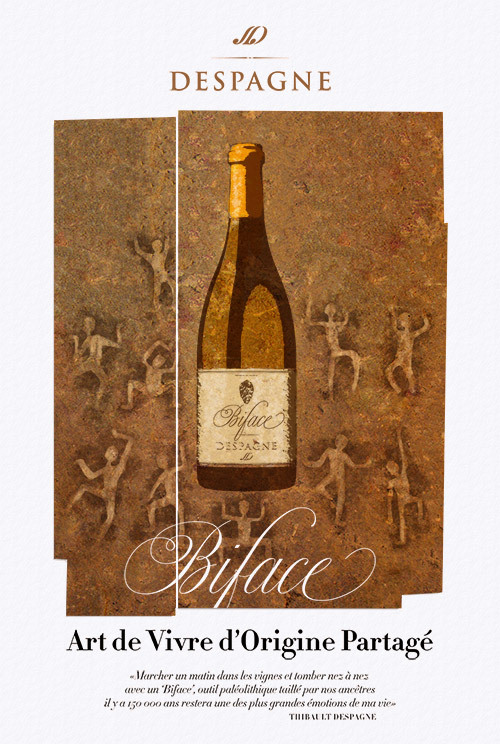 Biface pays tribute to those human beings and to fine, vibrant white wines, which provide moments of lively conviviality. Biface is the product of our most aromatic Sauvignon grapes, perfectly adapted for blending with a juicy, rich Sémillon variety grown on old blocks of the vineyard. This blend gives birth to a wine with well-defined aromas softened by the characteristic salinity of our terroirs. Enjoy a glass with mature goat cheese on fresh bread topped with a trickle of extra virgin olive oil. She became a living legend, and is still recognized as the Queen of the Night. The Despagne family has been paying tribute to her for seven generations and is honored to be able to share the myth with you! The robe of Amphorie is pale and luminous, with a nose characterized by subtle aromas of grapefruit and red fruit, enhanced by that of white flowers and notes of acacia. In the mouth there is a perfectly balanced combination of vivacity and generosity, freshness and zests of citrus fruit. An entertaining complexity derives from the blending of our old companions Cabernet Sauvignon and Cabernet Franc, with a touch of Merlot to spice things up a bit. Delight in a drink accompanied by ripe avocado spread on toast with a trickle of hazelnut oil, tuna rillettes with carrot chips, or a selection of delicious raw ham. Everyone has experienced a “right place, right time” moment, where by chance life puts you where something good is going to happen exactly when it does… It’s a world where everything that is possible opens up for us, where the contents of Pandora’s box are no longer a mystery. L’Onde represents all of that at the same time, a rhythm of Nature, the virtuous cycle that will lead the winemaker down the right path if he’s a good listener. Without needing to read visible signs, he becomes one with his terroir. He and his vines grow together, in order for them to give the most of themselves with one unique goal in mind: your pleasure. 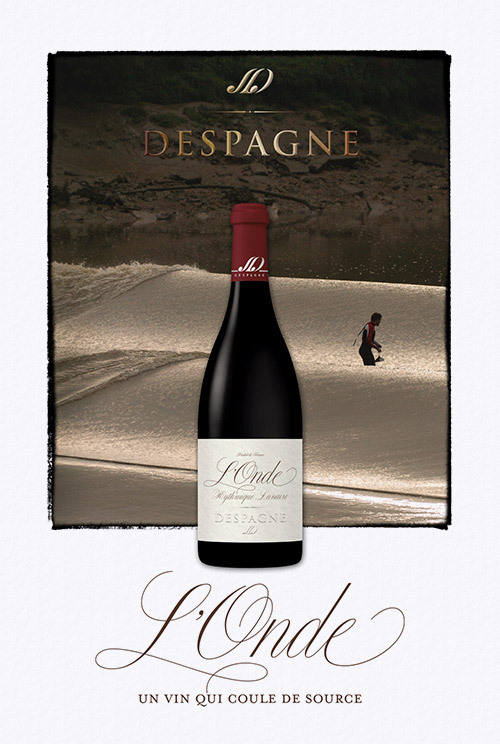 L’Onde exudes freshness and is a pleasure to drink. L’Onde titillates your nose with its fragrant Cabernet Franc and softens your cheeks with the smoothness and full body of its Merlot. Without aging and few sulfites, we want to preserve the taste of fruit: a slightly peppery red fruit. Another clear advantage: the low alcohol content. Pour a glass to accompany a homemade guacamole on fresh bread topped with a few pine nuts, or roasted eggplant slices with extra virgin olive oil and rosemary.